On 14 September 2012, the RIPE NCC began allocating IPv4 address space from the last /8 we received from the Internet Assigned Numbers Authority (IANA). Nobody was entirely sure what would happen when we reached this point. Would there be a "run on the bank" for this final block of addresses? Last week, we made our 1000th allocation from the final /8 and five months after reaching this point, we can report back on what we've seen so far. Prior to reaching this milestone, the RIPE community had already developed policies to govern how the RIPE NCC would allocate the remaining space. The last /8 policy ensures that each member of the RIPE NCC can receive one final /22 of IPv4 address space (1,024 IPs) from the last /8. With approximately 16,000 /22s in a /8, and around 8,800 RIPE NCC members, the RIPE community decided that this approach would give Local Internet Registries (LIRs) some breathing room to make the transition to IPv6, and would also ensure new entrants to the industry could access IPv4 address space. As pointed out in the most recent article RIPE NCC Membership - 2012 Statistics, the number of IPv4 allocations issued since September has remained stable. 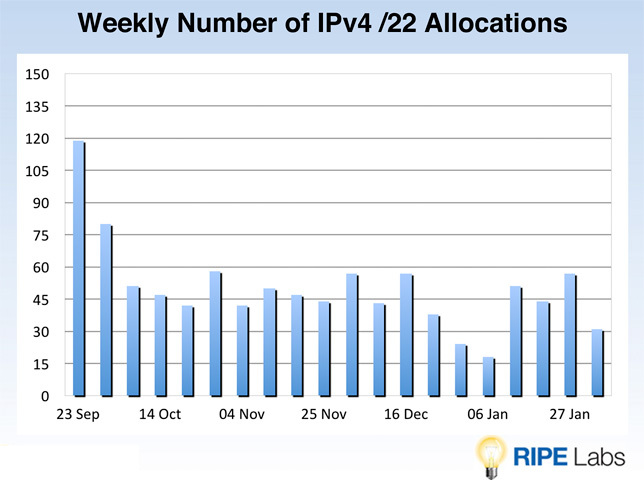 In Figure 1 below, you can see the number of IPv4 /22 allocations per week since September 2012. The numbers were a little lower in the second half of December but they increased again in January 2013. Note that the last bar doesn't show a full week but ends on 31 January — the day we handed out the 1,000th IPv4 /22. As you can see in Figure 2, most allocations in the first two months were existing LIRs claiming their final /22 (additional allocations). This might be due to those requests that were already ongoing when we started allocating from the last /8. 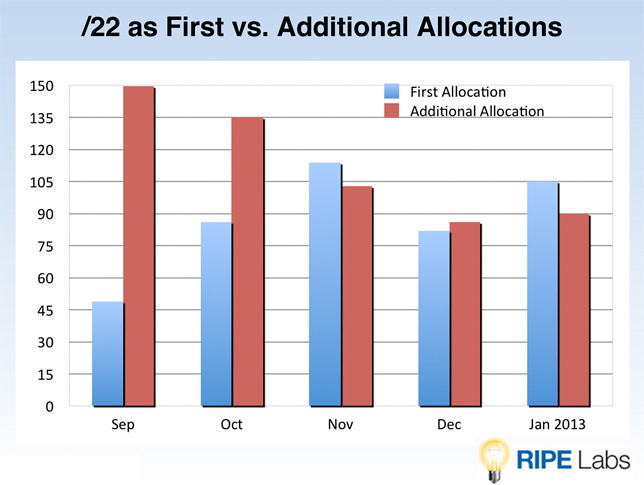 Since November 2012, the majority of /22 allocations were made as first allocations to new LIRs. This indicates that the last /8 policy is ensuring that new entrants in the industry can still receive a small block of IPv4 address space for the foreseeable future. This had been one of the motivations behind the RIPE community putting this policy into place. In summary, we can say that even though the number of IPv4 allocations has been fairly consistent since September, we haven't see a big run on the last block of IPv4 addresses. Considering the fact that we have over 8,800 members, 1,000 /22s allocated over five months is a moderate number. Also, when looking at the distribution of first verses additional allocations, the last /8 policy is working to allow new organisations to enter the market. For more information and additional graphs, please refer to the background article on RIPE Labs: 1,000 /22s Allocated from Last /8.